Mom, the Intern: Do you like free food? 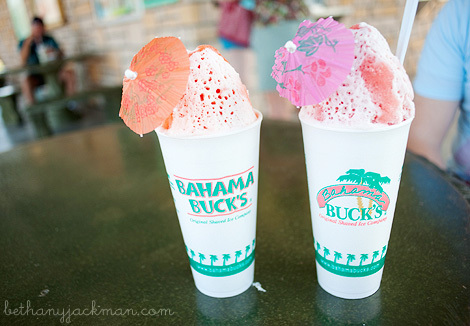 I particularly like free shaved ice that's as smooth as velvet, and no one does it better than Bahama Buck's. So if you live in east Mesa like I do, then TOMORROW, December 4th, you should head over to Bahama Buck's on Power Rd just south of Baseline or to the Signal Butte and US-60 location to get your FREE 12 oz. shaved ice. Any flavor(s) of your choice, and they have a bajillion so that shouldn't be a problem. Well, actually, it's always a problem for me because they are all so yummy, so I have issues making decisions. I'm sure I'll be going since the Signal Butte location is but a stone's throw away from my house. Get my kids all hopped up on the good stuff. Sweeeeet. Check out the Facebook event page for more deets, yo. Oh I am so jealous right now! I love shaved ice! !